From birth to 3 years old, such a fragile and equally important time. When we talk about the human life, we understand this time the same manner we relate to the roots when we talk about a plant. Throughout this time, the wonderful gift of nature is bestowed upon the child, and that is the gift of the human life itself which she is going to develop, the same way the seed receives and carries within itself the full features of the grown plant. A child’s evolution beyond the age of 3 relies on her fulfillment up to that moment, the same way a growing plant mainly depends on the health of the root. A wonderful thing happens at three years old: the child’s self awareness starts to awaken. Which are the changes in her life going to be triggered by this fact? How do we look at them and how do we, the adults, adapt to these changes? How has the child developed until now with respect to language and movement? What are the temperament and the personality of each child? These are but a few questions you will find the answer for throughout this training course. – 3-6 Montessori Teachers. They will have the opportunity to understand on a deeper level the children who are younger than three, coming from toddlers groups and guide their parents through the transition process. – Future Montessori students attending the 3-6 Montessori Teacher Training Course starting on October the 30th, 2017 at the Montessori Institute of Bucharest. This seminar represents an introduction that is going to help the future students make connections between the two periods of early childhood: 0-3 and 3-6. – Montessori kindergarten and school managers. They will grasp a clear and real perspective on the children’s needs throughout the age of 0-3. – Parents. This seminar is a great opportunity for parents to deepen the information they have on the child who up to 3 years old, as well as on the changes she is going through as she approaches the age of 3. 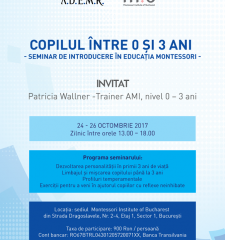 The seminar is held by Patricia Wallner, AMI 0-3 Trainer. Patricia has started her activity in Montessori pedagogy in 1970. She graduated the AMI 3-6 Training Course in Washington D.C. As she moved to the Netherlands, she started working with Mario Montessori at the AMI Association Montessori Internationale Headquarters, founded by Maria Montessori back in 1929. Between 1985 and 1986, Patricia has attended the AMI 0-3 Training Course in Houston, Texas, under the supervision of Dr. Silvana Montanaro. Then, for 17 years she worked in a bilingual community for children up to 3 years old in Amsterdam, the Netherlands, where she currently lives. In 1995 she started her training of trainers with Dr. Montanaro, in order to become an AMI 0-3 Trainer. At the same time, she also graduated a Master Degree in Educational Sciences. Patricia has taught students in Rome (Italy), London (UK), Golden Coast (Australia), Yokohama (Japan), Varberg (Sweden), Zurich (Switzerland), St. Petersburg (Russia), and the United States of America in San Diego, California and Portland, Oregon. She lectured in Asia, Europe, Australia, and the United States of America. Her greatest hope is to increase the interest in Montessori 0-3 pedagogy across Europe, to work with the parents and encourage as many persons as possible to train for the work with this age group since this is the time when all the experiences are impregnated for life and they can hold the explanation for certain behaviors of the future adult.